The universe is beautiful, and the range of telescopes that astronomers use are like a symphony orchestra, with many different instruments contributing to our knowledge of the universe. The Hubble telescope has a relatively narrow field of view, but can see deeper into space. The large ground-based telescopes can take wide-angle shots, and Infra Red or radio telescopes can detect differences in temperature. The universe is vast and active, with old stars disintegrating and exploding into clouds of gas, and new stars forming as those clouds coalesce again. It takes several generations of stars to generate the chemical elements that are needed for life. 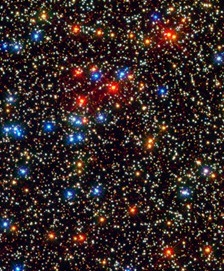 When the right factors are all present, a star coalesces and dusty discs develop around it from which planets are born. Galaxies such as the famous spiral galaxy contain around 100-200 billion stars, and there are at least 200 billion galaxies in the observable universe. Even if planets are rare, might there not be life elsewhere in this vast cosmos? There are now a thousand confirmed exoplanets, and research is still gathering pace. We might have as many as 5 billion planetary systems in our own galaxy. What scientists like Jennifer want to find out is, what fraction of the stars in our galaxy harbour potentially habitable planets? The easiest way to start is to look for planets similar to our own, because we already know Earth is hospitable to life. So we need Earth-sized planets with a crust, the right temperature for liquid water, and evidence of elements like oxygen and carbon in the atmosphere. By the time of Jennifer’s talk about four Earth-like candidates had been found. The most promising one is too far away to do follow up study, but planets seem to be so common (perhaps one for every star in our galaxy) that it might not be long before we find one a bit nearer. Another was announced the week after the talk: one that showed evidence of water vapour in the atmosphere. This new planet is so hot that it’s unlikely to contain life, but it’s a start. I am excited about the search for exoplanets, because if we find even very simple cells on another planet that would teach us a huge amount about how life developed. Does it always involve DNA? What might the precursors be? Are there alternative ways to generate life? Jennifer Wiseman said that the human responses to the grandeur of the universe span a wide range. The data doesn’t tell you how to reflect on it, so your reaction depends on your perspective. As a Christian it leads her to worship, and I agree. I believe in a big God who is immensely creative and immensely generous. What we find in the universe helps me to understand a little more about him, and my awe turns to praise. Wonderful indeed. As I middle-aged guy I feel privileged to have lived during the two proverbial periods, the first one when no planets out of our system were known and many people even doubted that they existed atvall to right now, a mere 20-something years later when we KNOW that they are out there, including some similar to our own planet. I co-teach a non-science majors astrobiology course, and it is so exciting because every single year we have to add material from the news because so many things are being discovered! It is my favorite course to teach (don’t tell my fellow pharmacologists/neurobiologists… (:-)…). Thanks do the post. Jennifer Wiseman said that the human responses to the grandeur of the universe span a wide range. The data doesn’t tell you how to reflect on it, so your reaction depends on your perspective. It seems this ‘grandeur’ is a secondary response to the primary ‘view of life’, which is Darwin’s construct. In any case, I am bemused by the current enthusiasm for anticipating life ‘under the next atmosphere’ to be remotely probed by the world’s growingly accomplished astronomers. Especially among Christians it is reminiscent of the Victorian enthusiasm for speculating on the possibility of life on our near planetary neighbours. Although Conway Morris is a little ambiguous about his view at the conclusion of his book, ‘Life’s Solution: Inevitable Humans in a Lonely Universe’, I am much happier to settle for the opinion that even though evolutionary convergence may be ubiquitous here as a phenomenon, it is quite another thing to suggest that the whole process has been set off with anything like the frequency that would mean we would ever see evidence of it from here. Even just once, using telescopes, never mind on the moons of gas giants in our system. Is there a sense of ‘setting out a stall’ here? Is there a human calculation being made that says, we would rather have been seen discussing the existence of extraterrestrial life before its discovery, rather than holding our tongues and being skeptical? That it would look bad to be ‘proved wrong’ about ET and so bringing the faith position into ridicule yet again? I am much provoked by your final paragraph; I continue to wonder how we can appropriately navigate the category shifts between appreciation of great complexity, wonder, awe and then worship. Thank you for prompting further cogitation on this.